Picking a dentist for your child is a decision that can impact their health for years to come. Without doing the proper background work, you could end up choosing a dentist that could traumatize your child, leading to negative oral health outcomes. Choosing your child's first dentist can be overwhelming, but if you review dental practices using our tips below, you're sure to be on the way to a healthy mouth for life. This is also a choice that should be made sooner, rather than later, as delaying your child's first dental visit and ignoring their oral health can lead to establishing bad patterns for life. A paediatric dentist is not just a skilled dentist, one with expertise in little mouths, but also someone who can express sensitivity and soothe the anxiety of both the parent and child. 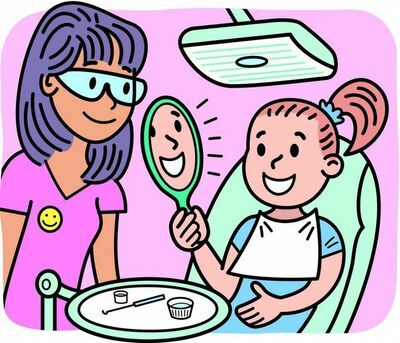 While it might be a good idea to let your child "visit" your dentist, or even let them watch you get your teeth examined or cleaned, you don't want to take your child to your dentist. A practice that specializes in paediatric dentistry can ensure your child has a positive experience from the beginning. This is a great search tool from the Australian Dentists Directory to find dentists in your area. Your next step after finding a list of paediatric dentist in your area is to meet with them. You and your child should both meet with the dentist, and the first visit should be merely a consult. It's important to observe how the dentist interaction with your child, and pick someone with a warm manner who treats you and you child with respect, and makes you both comfortable. No actual dental work or exams should be done during these initial meetings. A dentist who can't make time to answer your questions, make you and your child comfortable, or who brushes off any concerns or fears is not the right dentist for your family. This behavior should disqualify them from your list. An excellent paediatric dentist will also be an excellent educator. It's important to have a dentist who can teach both you and your child how to care for their primary teeth, explain how to fix any problems that may arise, and put your child on the road to good oral hygiene for life. You'll want to make notes about the dentist and the atmosphere in the clinic during your initial visits. While visiting the dentist needn't be the highlight of a child's day, the paediatric dental office should be a comfortable environment. The dental offices should have child sized equipment and furniture, along with toys and other items to educate and entertain very small children during the appointments. A dentist visit is intimidating enough without having a child in an adult sized dental chair. The office's support staff should also have a warm and friendly manner, working to put both you and your child at ease. After your initial visits you should examine your notes and make a few final selections. You'll then want to ask your child what they thought about the various candidates. Understand that while you need to trust the dentist to work on your child, your child also must like and trust the dentist as well. If your child is not able to articulate a clear preference, then you should pick the dentist that you think is the most qualified, with the office that your child seemed most comfortable in. Choosing a dentist in this manner can seem like a lot of effort, but knowing that you've set your child on the road to good oral health will be invaluable. Ensuring that beautiful smile for life is just an added benefit. Take a look at this great guide on healthy teeth protection for children.